I finally landed at Dulles in a tiny plane that didn't have any overhead space. The plane was so small that I sat in single row of seats on one side and 2 seats on the other. My carry on was too big and must be checked in at the gate. Fortunately, I didn't have to go through the baggage claim to get it back as they were ready for me when I walked off the plane. I quickly got my rental car and I was racing to Wash DC!! My heart was racing as I've been wanting to see Cherry-Blossoms in person and the fact that I almost missed that chance today due to a flight delay really added to the anxiousness and drama. When I finally got there, I couldn't find parking space. Just my luck I barely missed several parking space because I was just a few seconds too late. Giving up all hopes, I drove out of the lot and parked somewhat illegally on the grass as many other cars were doing as well. It was a short walk to the Potomac but it's better than nothing as I was racing against time. If I lose the light then I would have flew her for nothing. Fortunately, there were plenty of day light still for great photo ops. The photo above is one of many photos I took. 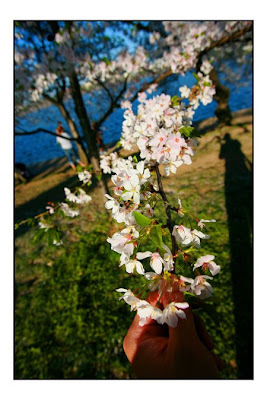 I used my hand in the picture to get a scale in relations to the Cherry-Blossoms. You can see my long shadow from the side as it's close to dusk when I took this picture. Here's short video as I walked through the park near the Potomac River. Surroundings include the Jefferson Memorial and in line of view of the Washington Memorial. It was somewhat windy as you can her in my video. Whenever it blows, the petals flew like snow and I felt like I was engulfed by the cherry blossoms. What a wonderous feeling as I can't really describe in words of the beauty of the cherry blossoms in this quantity. It's everywhere and it's beautiful as far as you can see as it lined the edge of the Potomac. I'm glad that I made it as it was explained to me that it's currently in full bloom that's why it's so beautiful. When in full bloom it would only last a day or two. Wind and rain will shorten the longevity of the bloom. In fact, the following day rained hard and the full bloom was shortened this year. Also, I was fortunate that it was a sunny blue sky kind of day and it really adds to the beauty of the cherry blossoms. This time of year, DC is usually cloudy and gloomy. The locals were saying that they would be happy that it wouldn't rain so that they can enjoy the beauty of the cherry-blossoms. Cherry Blossom Festival 2007 from Terry Chan on Vimeo. Cherry Blossoms Festival 2007 II from Terry Chan on Vimeo.